Static in your hair or the sparks that fly when you touch someone or something in winter are sure signs the air in your house is too dry. 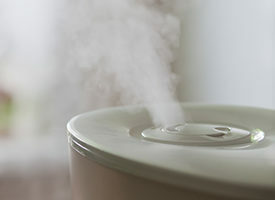 Setting up a humidifier is the best bet for improving indoor air quality and your breathing, according to pulmonologist Kathrin Nicolacakis, MD. The Environmental Protection Agency recommends keeping your home’s humidity level between 30 percent and 50 percent. 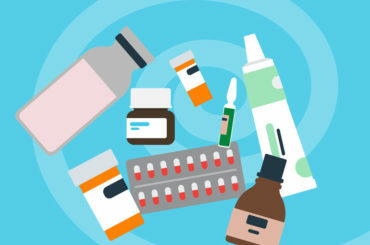 The agency also suggests using filtered water in humidifiers, if possible, to avoid the minerals and micro-organisms unfiltered water might contain. Dry air can wreak havoc on your nose and lungs and make existing conditions worse, Dr. Nicolacakis says. And, humidity levels that aren’t optimal can harm everyone. Regardless of what kind of humidifier you choose, she says, everyone should have some type of humidifier in their home. Central humidifier: This humidifier is built directly into your home’s heating and air conditioning system and can control the humidity level throughout your entire house. It’s the most expensive option, Dr. Nicolacakis says, but it’s the most effective choice. Evaporators: This type of humidifier blows moisture through a moistened filter. Fans push the humidity out into the room. Impeller humidifier: This option creates a cool mist that is pushed out into the room by disks that rotate at high speed. 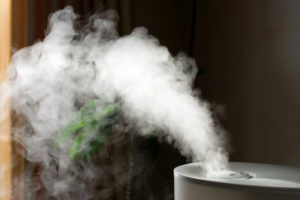 Steam vaporizer: This electric-powered option heats water and cools it off before pushing water vapor out into the room. Vaporizers can be moved from room to room. Ultrasonic humidifier: Like an impeller humidifier, this humidifier spreads a cool mist through the room via ultrasonic vibration. Keep tabs on your humidifier to ensure it’s clean and in proper working order, Dr. Nicolacakis says. Refresh the water. Room humidifiers use a gallon of water daily, and you must change the water to avoid any mold or bacteria that could grow in standing water. Wash any buckets or filter systems every two to three days, as well. Change your filter. If you have a central humidifier, change the filter monthly. Check the humidity level. Check your home’s humidity level every few days, because too much humidity can also cause lung problems. High moisture levels in the air can trigger allergies and asthma, as well as promote the growth of mold, bacteria, mildew and dust mites. Consider purchasing a hygrometer that will keep a constant measure of your home’s humidity, she says.